We think Grace Lutheran School is a wonderful place to work. At Grace, we are blessed to work in a Christian environment surrounded by others who work together to bring our Christ-centered vision and mission of education to fruition. We are currently hiring for a full-time position as a floater in the Child Development Center. We strive to inspire children and help them grow on a daily basis. We help families by providing their children a safe, positive, and Christian learning environment that prepares them for the next step in their lives. We are also hiring substitutes and have a need for subs pretty regularly. This position is on an as needed basis. However, with open availability, substitutes can get a good number of hours each week. We do often hire our subs on full time if a position becomes available. Assist lead teacher in ensuring that the classroom meets safety and health requirements. This includes but is not limited to maintaining classroom, materials and equipment in a clean and safe condition. Attend to the children's basic needs (assisting with bathroom accidents, runny noses, etc.) and provide for the children's physical, emotional, intellectual and social growth. Assist the lead teachers in conducting a developmentally appropriate program of educational activities in accordance with the school philosophy and curriculum. Work closely with lead teacher to understand the goals and objectives of the program. Communicate effectively, positively, and with the appropriate professional speech when speaking with parents/guardians. Model appropriate behavior and speech patterns at all times for children to imitate. Ensure that each child feels welcome. Greet each parent and child upon entering or leaving for the day. We look for previous experience, character, education, integrity, past employment history, and above all, a true love for children. All teachers and substitutes have to have a background check, TB test, and medical done. We are currently seeking a part-time Spanish teacher, for approximately 25 hours a week, beginning in January 2019. We seek a dynamic teacher with strong classroom management skills who inspires students to learn Spanish and who works collaboratively with colleagues within a faith community. Candidate must be fluent, have a strong knowledge of Spanish grammar and vocabulary, and preferably have training in second language instruction. Candidates should be passionate about teaching and celebrating Spanish language and Hispanic culture. Excellent verbal and written communication skills required. We are open to the possibility of sharing with another local school with similar requirements. The ideal candidate supports school goals and participates in school programs and activities as deemed necessary by the principal. The teacher may be required to participate in after-school activities occasionally. 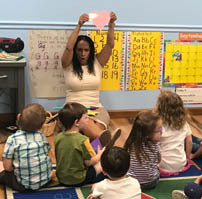 Our growing childcare facility is looking for teachers who can help to create a fun environment and incorporate educational programs that assist in our children’s development. The teacher's assistant will be responsible for monitoring and teaching the toddler children in our program and partnering with our team to enhance the learning environment at our school. If you love working with kids and have previous experience in an early learning environment, please apply today. Ensure that the classroom meets licensing, safety, and health requirements. This includes but is not limited to maintaining classroom, materials and equipment in a clean and safe condition. Attend to the children's basic needs (assisting with bathroom accidents, runny noses, etc.) and provide for the children's physical, emotional, intellectual, and social growth. Conduct a developmentally appropriate program of educational activities in accordance with the school philosophy and curriculum. Carry out posted lesson plans. Communicate effectively, positively, and with the appropriate professional speech and annunciation patterns when speaking with adults. Prefer a minimum of six months experience working with children. Flexible and energetic on the job. Have the ability to juggle multiple duties. Ability to resolve conflicts between children. Please contact Allison Merrill, Child Development Center director, via email or by phone at (256) 881.0553. Interested in Being a Sub? If you would like to be on our sub list, please send us a message requesting an application, or send your resume’ directly to our school principal, Mr. Mike Ellis.